If you are starting to lose your hair or your hair looks unhealthy what steps can you take to prevent it? a. Quit smoking. Each cigarette releases 10 quadrillion free radicals into the lungs, which are damage our skin. A healthy scalp promotes healthy hair. b. at a healthier diet. Get more green vegetables and fruits into your diet. Drink plenty of water. Most stylists recommend a trim every six weeks. A regular trim will help prevent or get rid of split ends. Avoid 2-in-1 shampoos. Shampooing daily isn’t necessary; in fact, it’s not even recommended. The detergents in most shampoos on the market will strip your hair of both colour and moisture. It’s a good idea to look for a sodium lauryl sulfate (SLS) -free shampoo. Do not use a brush on wet hair, because this is when hair is most vulnerable. Use a wide-toothed comb instead, and gently work out any tangles. Once hair is dry, a boar-bristle brush is best — this kind of brush smooths out the cuticle and helps distribute your hair’s natural oils from your scalp to your ends, giving you shine. Consider using essential oils or hair treatments to massage into your scalp and also using them as stimulants for hair growth and healthier looks. We are recommending Nutriol® Hair Fitness Treatment, which is work synergistically with The Galvanic Spa® II Instrument and Scalp Conductor to protect the future of your hair. Featuring Tricalgoxyl — a clinically proven seaweed derivative developed by a European laboratory, Nutriol is formulated to remineralize the scalp and hydrate the hair — helping your hair look and feel more abundant. 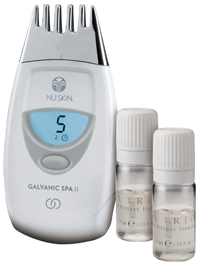 Using the Galvanic Spa Instrument and Scalp Treatment Conductor with Nutriol Hair Fitness Treatment accelerates the initial onset of benefits by facilitating the transport of key ingredients. Compatible galvanic currents and product formulation polarities enable this facilitation. For detailed instructions on how to use these products together, see the Product Information Page and Treatment Instruction Card below. Previous Article Ваш ребенок часто болеет, посещая детский сад? What’s up, I check your blog regularly. Your writing style is witty, keep it up!